We all know we need at least five servings of vegetables a day, but that can be challenging most of the time. With these vegetable soups, however, you can easily get ahead of the curve and enjoy several vegetables in one bowl! The ingredients for each soup are varied, but every recipe is healthy and nourishing. And all of these soup recipes are vegetarian, while most are also vegan. If this list leaves you wanting more, there are plenty of vegetable soup recipes to keep you healthy and satisfied! 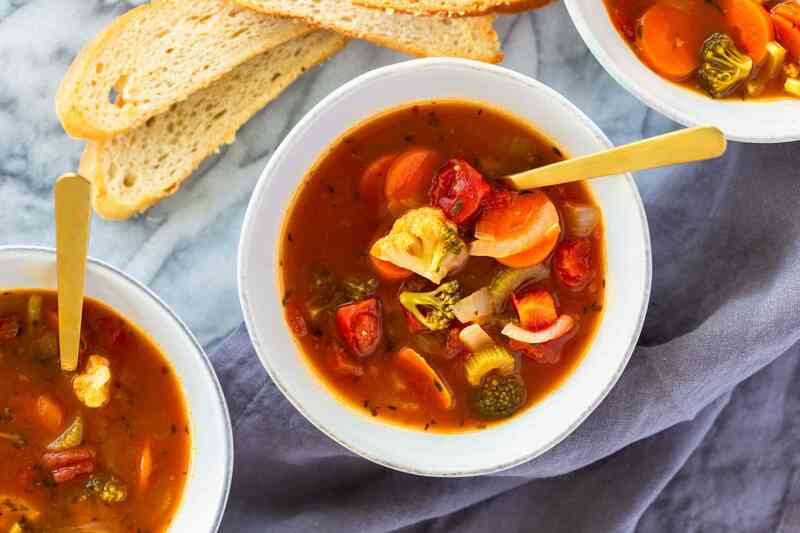 The only ingredients you need for a basic homemade vegetable soup are vegetables, water or vegetable broth, and a few spices. And that's all this basic vegetable soup recipe has, but feel free to add potatoes or a whole grain such as quinoa to fill it out a bit. Need it to be gluten-free? Just be sure to use a homemade gluten-free vegetable broth, or purchase premade. This crockpot split pea and vegetable soup is more of a hearty and filling stew than just another vegetable soup. It's filled with potatoes, green split peas, carrots, celery, and plenty of spices. Just as comforting as a basic vegetable soup, with the traditional home-cooked American flavors, this recipe has extra fiber and protein from the green split peas. 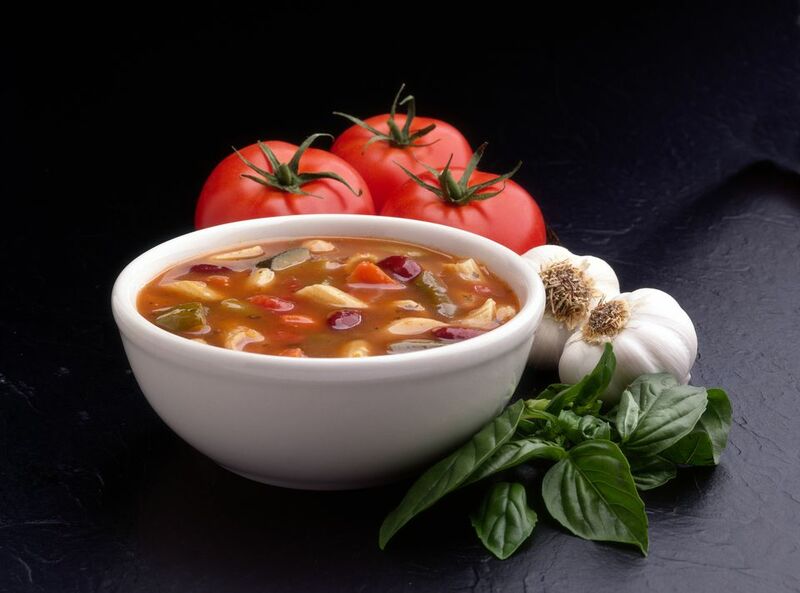 A simple but hearty tomato vegetable soup recipe with barley filled with tomatoes, carrots, celery, onion, and spinach, this recipe is rounded out with high-fiber barley. It is comforting and filling, and you'll make it again and again. The barley makes it more of a full meal than other vegetable soup recipes, so whip up a green salad and call it dinner! Fill up this vegetable soup with barley with whatever veggies you happen to have on hand. Though the recipe calls for carrots and celery, just about any ingredients can be substituted—try green beans, zucchini, or cauliflower, or whatever you may have in the fridge. Carrots, celery, onions, potatoes, and spinach combine with lentils for a low-fat and high-fiber vegetable soup. If you're looking for a simple and filling homemade vegetable soup recipe, this lentil and vegetable soup is a good one. This healthy soup could be a main dish if served with some toasted garlic bread and a side green salad. Tomatoes and carrots form the base of this nourishing tomato and vegetable soup, and lightly sauteed tempeh adds both texture and some healthy vegetarian protein. Turn it into a full meal by serving it alongside grilled cheese sandwiches for a simple homemade lunch the kids will love. As an added bonus, this homemade soup is both a high-protein recipe and also low in calories. Instead of a vegetable broth-based soup, why not try a homemade vegetable soup with a coconut milk base? The Thai coconut vegetable soup recipe calls for red peppers, fresh cilantro, carrots, lime juice, and tomatoes, and the Thai flavor comes from a bit of cumin and cayenne too. A nice change from traditional vegetable soups but one that may become a family favorite. This unique homemade Moroccan vegetable stew is inspired by the flavors of Morocco and sweetened with a bit of apple juice and raisins, yet still has all the traditional vegetable soup ingredients such as tomatoes, carrots, and celery. The chickpeas add extra protein and iron—perfect for vegetarians and vegans. When it comes to making a simple soup extra filling, adding a can of white beans and some Swiss chard is a great trick. As with most homemade vegetable soups, you can always vary the vegetables to use up whatever you need to get rid of in your fridge, or to satisfy every member of your family for this white bean and Swiss chard vegetable soup. Perfect in autumn, but so delicious you will want to eat it year-round, this luscious pumpkin and sweet potato soup combines pumpkin and sweet potato into a creamy, vegan and soy-free soup. The white wine and fresh thyme add a sophisticated edge, while the sweetness makes this soup one that even the kids will love. Warm up With This Vegan Pumpkin Coconut Soup Recipe!